Metallics are a fail safe at Christmas - get the look with these top tips. There are certain make-up looks that just scream Christmas to us; the classic red lip, a winged eyeliner and of course, metallic eyes. Offering a more sophisticated take on sparkle, we can’t resist a touch of silver, gold and bronze during the festive season. If you have a light skin tone, silver and platinum shades will look especially flattering. Darker skin tones should look towards golds and bronzes for a warmer take. Rose gold is universal and looks great on everyone. Are you creating a day or night look? Sheer formulas are ideal for the daytime, giving a subtle touch of shine, while more opaque formulas create a stunning evening look. Amp up the drama by layering your colour. To help your eyeshadow last longer and stay in place (i.e. not smudged under the eye!) remember to use a primer. You could either use your usual make-up primer, or get a dedicated eye primer. How you apply metallic shadow is up to you. Most people like the extra control they have when using their fingers as you can layer and dab on colour where you want. If you decide to use a brush, opt for a smaller brush for more control. Mascara helps to add definition to the eyes, making your metallic look pop. Go for black and don’t be shy – the bigger the lashes, the better! 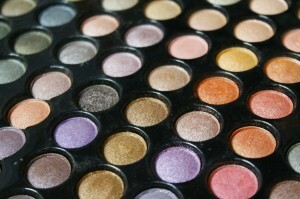 Even though metallic eyeshadows have a lot of sheen in them, it’s still worth highlighting the eye. Add a touch of white shimmer the the inner corners of your eye and under the brow bone. This will add dimension to your look. If you’ve gone big on the mascara, you won’t need eyeliner. If you don’t want to skip it, keep it soft, smudged and subtle. With so much shimmer going on around the eyes, it’s best to keep your base make-up matte. You can add touches of highlight, but avoid an all-over dewy look. Learn more make-up tips like these from a professional make-up artist.